Dr. Wright spoke to a full audience on November 15 from 5-6 p.m. at Fred Hutchinson Cancer Research Center. 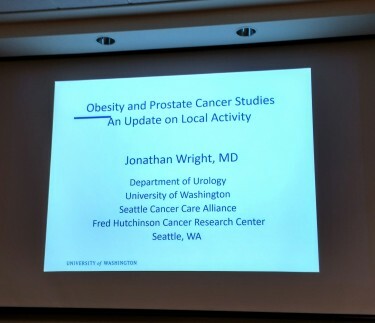 The topic of his talk was Obesity and Prostate Cancer: an update on local trials. A brief overview of data showing the increase of obesity prevalence over recent decades provided a baseline for understanding the link between a higher BMI and the risk of fatality in patients with prostate cancer. 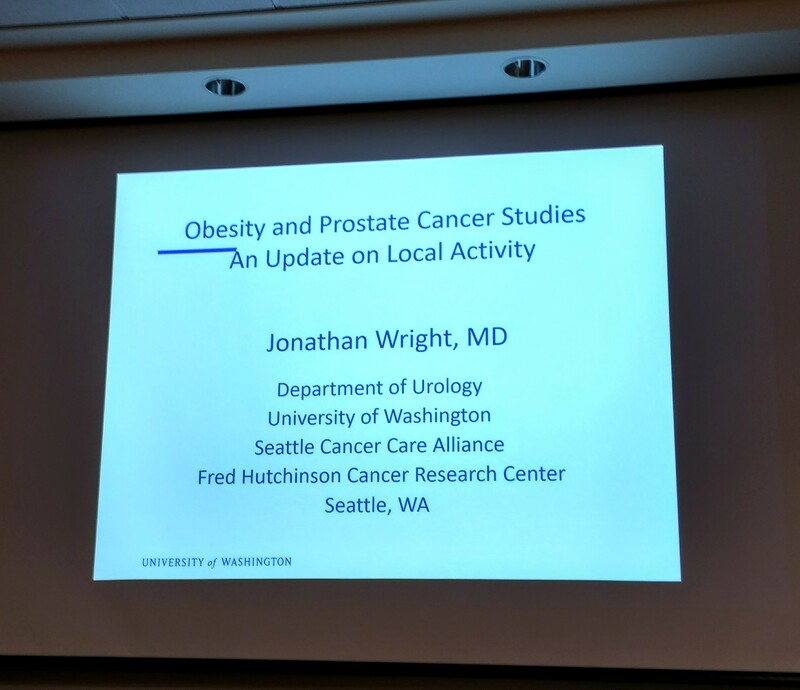 Dr. Wright then spoke about the Prostate Cancer Active Lifestyle Study (PALS) and its encouraging results in providing patients being treated for very early prostate disease with lasting lifestyle changes, including the ability to maintain weight loss through a lower calorie diet. The PALS study requires Prostate Cancer subjects to be overweight and excludes patients taking insulin and metformin. Each of the subjects has chosen Active Surveillance of their cancer, and is provided with regular 1:1 instruction with a dietitian and gym sessions with a Fred Hutch specialist. Though early recruiting efforts were challenging, the study participation gained traction through engaging communities of urologists at Valley Medical Center, EvergreenHealth Medical Center, UW Medical Center/Men’s Health Center and UW Medicine’s Eastside Specialty Center. Gaining permission to use the National Cancer Institute’s SEER (Surveillance, Epidemiology and End Results Program) registry also contributed to an upward swing in study participation. Dr. Wright recognized the PALS team of physicians and health experts for their true team effort and credited them with the study’s rate of success in bettering the lives of patients. Planning for the future direction of study was presented, including the PALS II (DEMAND) Study, currently under grant consideration, to involve oversight for improvement in diet and exercise with the goal of mediating the effects of Androgen Deprivation Therapy in patients with later stage disease. 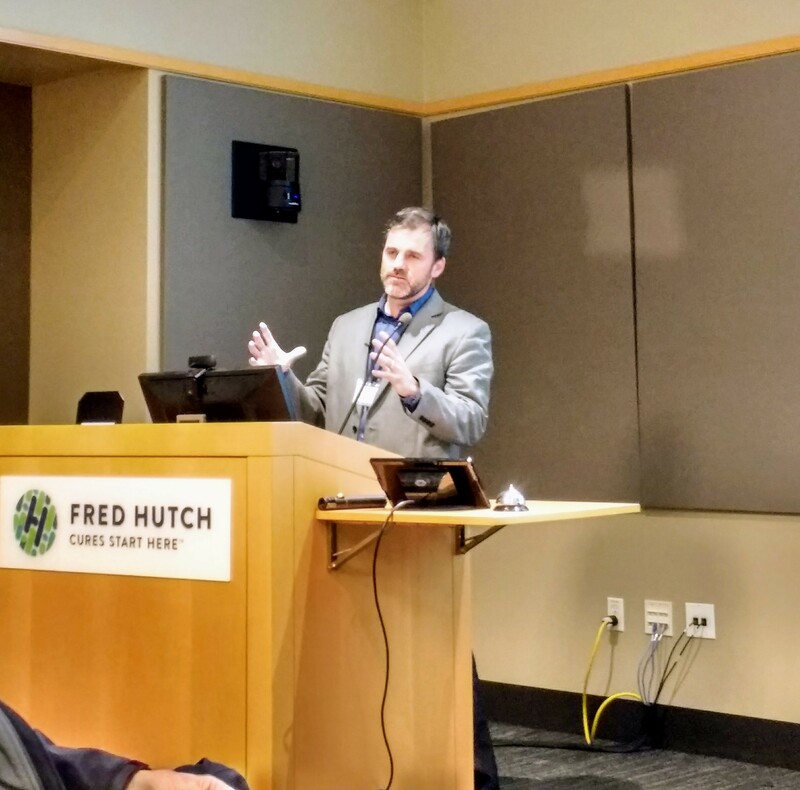 The talk concluded with an active question and answer session with audience members from the clinical and research communities at UW Medicine and Fred Hutch.